A MOST SUBSTANTIAL DETACHED FAMILY HOME WITH SPACIOUS, FLEXIBLE ACCOMMODATION AND BEAUTIFUL GARDENS EXTENDING TO OVER TWO ACRES. This excellent home provides generous accommodation that is complimented by a truly impressive living room with a high vaulted ceiling, gallery and large windows overlooking the grounds. In addition there are five generous bedrooms, two en suite, a large hallway, dining room, a large kitchen/breakfast room, utility room, a cloaks shower room and a family bathroom. Within the grounds are two excellent 'Home Offices' and a huge modern secure Workshop (approx 62' x 21') that is ideal for those with an interest in classic cars, work from home or who require storage. Location: - The property is situated just to the west of the pretty market town of Buntingford and is within 30/40 minutes drive of both Stansted and Luton airports. The neighbouring towns of Royston, Ware, Hertford and Stevenage all provide rail connections into London and are within 15 or 20 minutes drive. Buntingford itself is just two miles away and is a traditional markety town with a good selection of shops, schools and recreational facilities. The A10 is joined at Buntingford and subsequently links to the M25 with the A1(M) at nearby Stevenage. Reception Hall: - 21'4 x 6'10 (6.50m x 2.08m) - Front door with double glazed side screens to each side leading into the spacious hallway. Double glazed window to rear. Radiator. Cupboard housing fuse box & meters etc. Wall mounted alarm panel. Cloaks cupboard. Cloaks/Shower Room: - 11' x 4'10 (3.35m x 1.47m) - Attractively fitted with a contemporary suite with large shower cubicle, WC, wash hand basin, heated towel rail, extractor fan. Fully tiled walls and floor. Impressive Living Room: - 23'10 x 23'8 (7.26m x 7.21m) - A truly impressive room with 20' high vaulted ceiling and large triangular feature double glazed windows to the rear with sliding double glazed doors opening onto the rear garden. Further double glazed windows to each side of the room and two Velux roof lights. Minstrel gallery with Oak flooring overlooking the living room approached from a concealed staircase. Italian marble flooring with underfloor heating. TV point. Wall light points. Designer wood burning stove. Dining/ Family Room: - 12' X 11'2 (3.66m X 3.40m) - Double glazed window to the side aspect. Coving to ceiling. Feature fireplace. Wall light point. TV point. Kitchen/Breakfast Room - 21'6 x 13' Overall (6.55m x 3.96m Overall) - Refitted with an extensive range of floor standing & wall mounted units incorporating various display plinths & plate racks. Work surface and breakfast bar area. One and a quarter bowl stainless steel sink with mixer tap & drainer to side. Integrated four ring halogen hob with extractor canopy. Integrated dishwasher. Built in Bosch double oven. Space for freestanding Fridge. Extensive tiling complimented by earth fired tiled flooring. Double glazed windows to both front and side aspects. Utility Room: - 9' x 8'4 (2.74m x 2.54m) - Single drainer stainless steel sink with cupboards beneath Two double glazed windows & double glazed door leading out to the large patio area. Floor standing Boulter Oil fired boiler serving hot water and central heating. Further worktop with appliance space beneath and plumbing for washing machine. Wall cupboards. Spacious Inner Hallway - The inner hallway provides a distinct break between the living accommodation and bedroom areas. With stairs ascending to the first floor. Under stairs cupboard, 2 radiators and double glazed window with aspect to side. Family Bathroom - 9'4 x 5'9 (2.84m x 1.75m) - Attractively fitted with a contemporary suite and fully tiled walls and floor. Panel enclosed bath with shower over. WC and wash basin set into a vanity unit with cupboards and shelves. Ladder style towel rail/radiator. Extractor fan Double glazed frosted window to the rear aspect. Bedroom Two: - 15'10 x 9'5 (4.83m x 2.87m) - Radiator. Double glazed windows to two aspects. Bedroom Three: - 15'10 x 12'8 (4.83m x 3.86m) - Radiator. Double glazed window to front aspects. Bedroom Five: - 12'1 x 5'9 (3.68m x 1.75m) - Double glazed window to front. Radiator. Bedroom Four: - 29'5 x 10'1 (8.97m x 3.07m) - A large bright bedroom with 3 double glazed windows to the rear aspect with views over the gardens. Radiator. Eaves storage cupboard. Door leading to en suite bathroom. 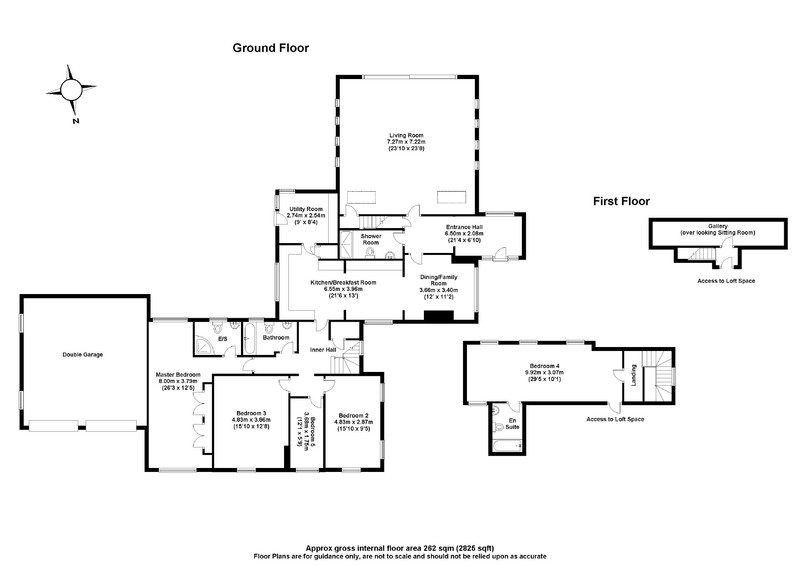 En Suite Bathroom - 8'7 x 5'5 (2.62m x 1.65m) - Fitted with suite comprising pedestal wash hand basin, close coupled WC, bath. Tiling to splashback areas. Electric shaver point. Extractor fan. Front Garden & Driveway - An impressive approach with sweeping gravel driveway offering ample parking for many vehicles that leads to the double garage. The front garden is well screened with mature trees and shrubs and mainly laid to lawn. Detached Home Office - To the front of the property sits a good size timber panelled 'Home Lodge' detached office. This is equipped with a sink, running water and electric heating. Double Garage - The property also benefits from a large double garage, integral to the property and fitted with twin up and over doors with lighting internally. The Gardens - Overall the plot is just over two acres and is predominantly laid to lawn with many mature trees, shrubs and mixed mature hedging giving a high degree of privacy. To the very rear and side of the house is a large Indian Sandstone patio laid over several levels together with a decked verandah all of which overlook the gardens and provide a wonderful area in which to entertain. Beyond the formal garden is a large paddock area that is ideal for a variety of uses whether it be for a pony, livestock or just for the children to enjoy. Set to the rear of the gardens is a large modern METAL WORKSHOP/GARAGE. 62'6 X 21'6 (19.05m x 6.55m) with light and power connected, garage door and personal doors. This building is a first class workshop and can be used for a variety of uses. Epc: - EPC Rating E.